Jollibee was just three years old when it began advertising in 1978. From a small Magnolia Ice Cream parlor put up in 1975 in Cubao, the visionary Tony Tan Cak Tiong, turned his dessert shop into a fast food restaurant, and the rest is history. By April of that year, Jollibee was operating 8 stores in Manila: 4 in Cubao, 2 in Quiapo and 1 each in Greenhills and the University Belt. The core offerings were burgers, and the flagship product was the YUMBURGER. Jollibee YUMBURGER was a basic burger consisting of two buns that sandwiches a 100% beef burger patty slathered with a special dressing. It was a no-fuss, no-frill burger that nevertheless, delighted its market that had a taste nor just for good food, but also value for money. Indeed, “the hamburger with a double yum” was just priced at Ph.2.95! The YUMBURGER was introduced in colored print ads mostly in weekend and women’s magazines in the first quarter of 1978. 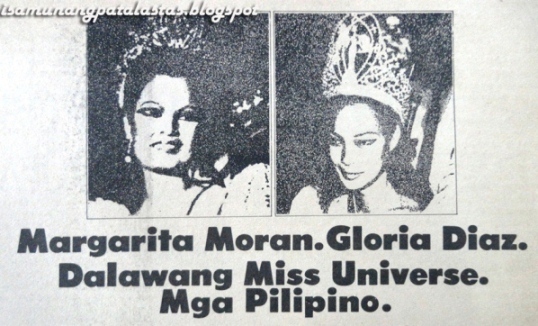 The print ad, whose maker or origin is unknown, was noteworthy for a lot of reasons. It marked the first appearance of the bee mascot as the presenter of the YUMBURGER. It looked more like an insect than the friendly, chubby Jollibee mascot that we know now (Jollibee consultant Manuel C. Lumba is credited with conceptualizing the vest-wearing bee with a chef hat. Likewise, revising the restaurant’s name to”Jollibee”). 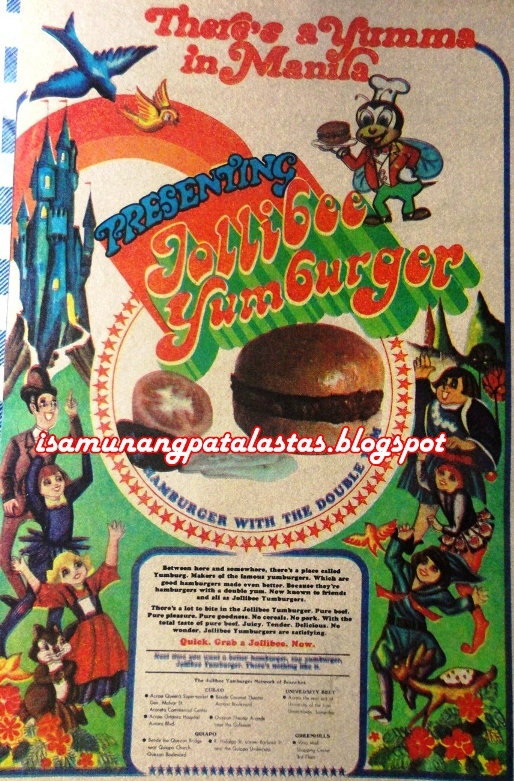 The origin story of YUMBURGER was also romanticized to appeal to children—the ad claims that YUMBURGER was created in Yumburg, “a place between here and nowhere”, pople by fairy-tale like characters. In any case, YUMBURGER offered “Pure beef. Pure pleasure.Pure goodness. No cereals”. 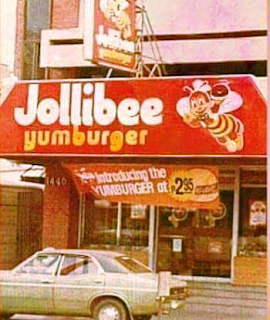 To underscore the importance of YUMBURGER to the nusiness, the early Jollibee stores were even branded “JOLLIBEE YUMBURGER”. As the world knows, Jollibee dealt McDonald’s, an American brand, a big blow, and today, continues to lord over the local market as the the country’s leading fastfood chain. It has grown exponentially, expanding with branches the world over—the U.S., Southeast Asia (HK, Taiwan) Middle East, Canada, Italy in Europe. All because of the burger that started it all—the YUMBURGER!